At this stage in the season, it’s a bit strange being a positive County fan. Every year we’ve been in the Premiership, and that’s us in our fourth season, we’ve gone into the New Year with trepidation after a few tough months that have seen us flirt with the relegation spots. This season’s completely different. We’re sitting in the top six at the start of 2016 and have every confidence that we can stay there until after the split. We’ve made it to the semi-finals of the League Cup for the first time in our history, and have dreams of replicating our famous win over Celtic at Hampden of five years ago. It’s a great time to be a Staggie. What’s changed that has made us this way? The answer is actually not a lot, and that stability is really the thing that has changed us from Premiership also-rans to one of the better sides in the league. Gone are the days where the January transfer window meant a glut of new players brought in from foreign climes to help salvage our season. We have a strong squad full of great players who seem committed to the County cause – all of which makes a crucial difference between scraping draws here and there and winning games from behind. We are a far more resilient team than we have ever been before, and that confidence breeds more confidence as time goes by. 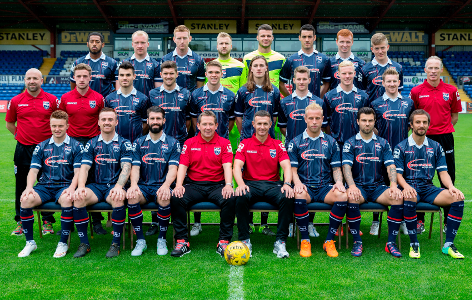 The spine of our side is rock solid, and by building our team around them with some quality additions we have been able to make what is probably the most attacking Ross County side there has ever been. Starting off from the back, Scott Fox in goals has been a revelation – with some stellar performances that have kept us in games but also a consistency that had been lacking from our previous keepers. New captain Andrew Davies has come in to the side and commanded the defence in a way that no-one has for County since the partnership between Grant Munro and Scott Boyd in the First Division. He’s confident, can win the ball and isn’t afraid to take the ball forward and make attacking moves. Having a player like that leading the line and starting our attacks has made a lot of difference this year. Jackson Irvine in midfield has been arguably our best player, providing a skill and flair that County have seldom seen before and being able to feed our wingers and strikers with the service they need to get goals. And up front we have Northern Irish star Liam Boyce, whose eye for goal has been impeccable this year and who has managed to hit the net even when he’s not been in the best form. These are just the stars, with other players like Ricky Foster, Michael Gardyne and Craig Curran all providing crucial support in getting forward and putting in the hard graft needed to win games. The effort from these three in particular has been special, and that is a feature that Ross County fans especially appreciate after having gone season after season with mercenaries who seemed as though they could care less about the club. Lots of credit should also go to Jim McIntyre, who has turned the club around 180° since taking over from Derek Adams. Despite a rocky spell while he got to grips with the players and managing in the top tier, he has now proven himself to be a manager that gets results as well as setting his team up to play attractive football. He’s able to make the decisions that win us games too, as his substitutions in the game against Dundee last week showed. We have been very lucky to have such a good head coach, and if he manages to keep us going in the top six we might well have a fight on our hands to keep hold of him. It’s not all positives though, as the game on Saturday against Caley showed. We have a tendency to concede soft goals, and even though we are one of the highest-scoring teams in the league we are often undone by our defence’s inability to clear our lines from set pieces, or to put in a decent tackle. This means that even though we limit teams to very few chances in games, they manage to take them. This is an area of our games where we need to step things up if we are really to hold on to our top six place. Finally, all of this success has been a product of a change in direction at the top level of the club and the board deserve their share of plaudits for what they have done. Their vision in allowing McIntyre to build his own team and to do it with the freedom of signing quality players on longer term contracts has made the world of difference to the side, and while the gamble was initially too much for a small, provincial team punching above their weight I’m so glad the board have finally seen the merits of self-belief and brought the club on to the next level. County seasons are usually a tale of two halves, with a tentative start bookmarked by a strong finish that propels us up the league. That’s not going to be the case this year, as I think our great start to the season will continue and that under McIntyre’s guidance we’ll steady ourselves and hopefully hold on to our place in the top six. Doing that would be a phenomenal achievement, and one that would more than equal our debut in the Premiership some four years ago. We have optimism that we can beat Celtic at the end of this month and go on to win the League Cup, and with the possibility of a second cup run in the Scottish Cup we could be on to a very special year indeed. Let’s just hope I’m as positive about things come May as I am now!